I believe this pencil has been discontinued in the not too distant past but it’s still available from a number of retailers. So even though it is discontinued I want to review it simply because it looks so nice. Pure eye-candy. There’s just something about the way it looks that I find extremely attractive. The metal body is available in a number of different lustrous coloured finishes, mine, as you can see, is blue. Weighing in at 18gm the Ohto Words is a little lighter than I expected. I feel the weight somehow does not quite go with the visual beauty and a slightly heavier construction would enhance the overall package. 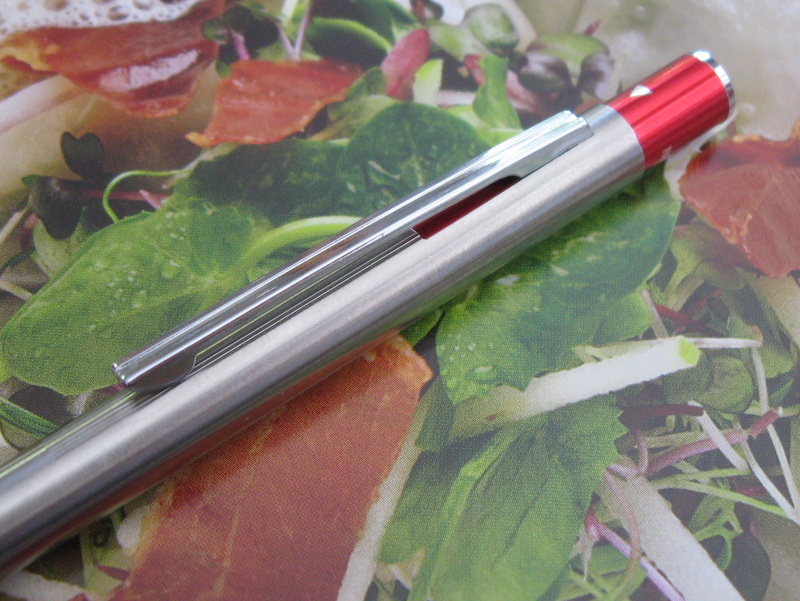 Ohto Words is a capped mechanical pencil, and you can use it with the cap posted or not. 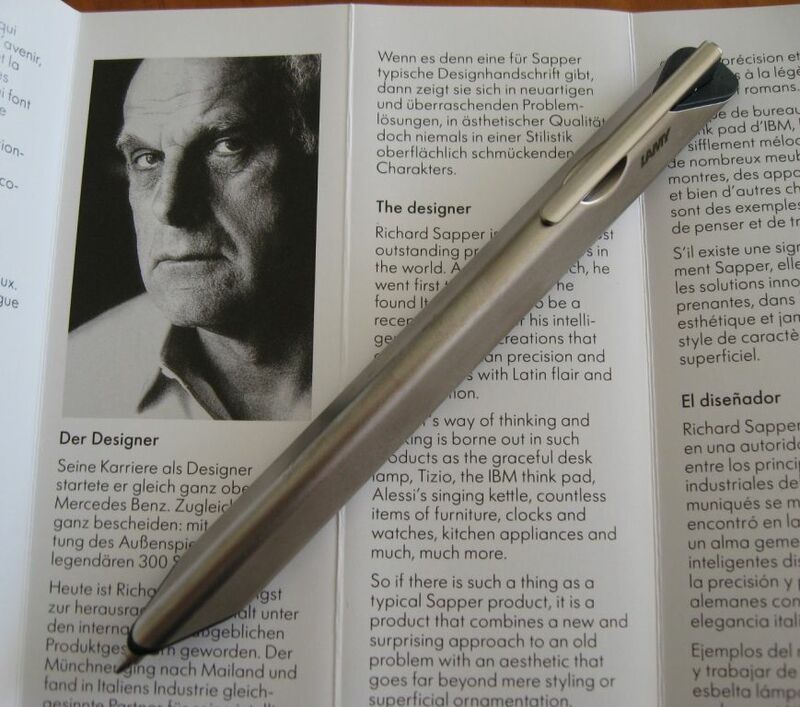 Personally, when writing, I prefer the look of it in hand with the cap posted…the long sleek elegant look. The cap is a very positive push fit onto either end of the main body. I always like to see a mechanical pencil comprehensively marked with brand, model name and number, and Ohto usually do, as they have with Words. The pocket clip is very sturdy and stiff, probably too stiff. You will certainly have to put in some effort to clip it to something. But its’ size, shape and colour combine with the cap section to make a truly aesthetically pleasing sight. 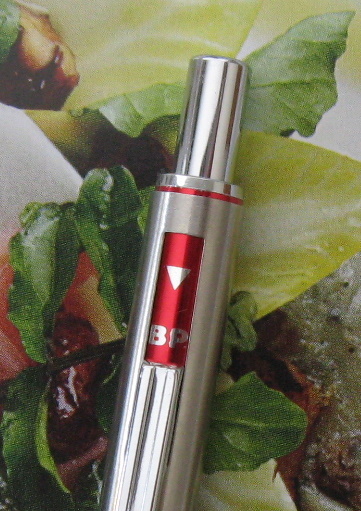 The lead sleeve is 2mm long and fixed, but of course the cap means this is a pocket safe mechanical pencil. The lead advance is a push top ratchet mechanism, operated by the rounded end piece of the main body, with or without the cap section posted on the body. Ten clicks will advance about 7mm of lead. You access the lead magazine by unscrewing the body and removing the otherwise hidden emergency eraser with lead jam clearance rod. 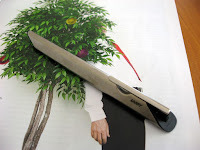 The grip section is rubber with fine grooves running lengthwise rather than circular around the body. The rubber grip does feel quite “grippy” so that is good, but I just hope that Ohto have used a rubber formulation that will stand the test of time rather than degrade over a decade or two. The fine grooves in the grip do catch the light and add to the appearance of the pencil. I said at the beginning that this pencil is eye-candy, but is also a great pencil. It is true threat to the Throne of Sharp Kerry. Ohto Words mechanical pencil – if you like a pretty pencil, then buy one now while you still can. It's a great deal at that price point. • Best Points – Did I mention how good it looks? • Not So Good Points – The pocket clip is too strong. • Does this pencil make it into the Top 5? – This is a really tough call, but after much deliberation I have decided “No”… except for its looks. Dimensions – Length 125mm main body only and 150mm with cap posted, diameter 8mm across the grip section. Balance point about 50mm up from the tip without cap. A Series of Sticks from Staedtler. I know a fair number of you are also interested in woodcase pencils, and I thought of you as I was organizing these for disposal. So free to a good home... well you have to pay for the postage. Staedtler Australia closed down their wooden pencil manufacturing quite a while ago, but here's a few you may be interested in. A little stroll down memory lane for me. I believe the top one is the oldest as it is gold printing, the other three are newer white printing. Quite the time series here. The top three have barcodes so are the newest. Note the ever changing printing - left to right, right to left, font size of AUSTRALIA, etc. The bottom one is quite different. The top two are the newest because they have barcodes. I assume the black print is the newer of the top two, black ink must be cheaper than gold. The bottom blue and red ones have different model numbers printed on them. So, if you want them for your collection, just pay for the postage and they are yours. As a rough guide, postage to USA = USD 12, to UK = GBP 9, to Japan = JPY 1,300. Email me, address via my profile link in "About Me" in the sidebar. I'll do a draw if more than one of you want them. Get in quick, they ain't makin' them no more! Time and tide, they wait for no man. The clock ticks for mechanical pencils too. Warning – Disturbing Content. Readers of a delicate disposition may require emotional guidance and support. Please be seated before continuing on. One thing is for sure, none of my pencils are getting any younger, and some of them are not aging well. Collectors of vintage pens and pencils are well used to corrosion, tarnishing, brassing, flaky plating and all manner of metallic ills, as well as shrinkage, cracking, hardening and so on of rubber and plastic. The moment a new mechanical pencil is manufactured it starts its journey to becoming a future vintage pencil… if it survives that long. As well as restarting this blog I have also recently been reviewing my collection with the goal of rationalizing it to the things I really like. This review of my collection has made me realize just how much degradation is going on, and so I share with you some sad stories and sorry sights. 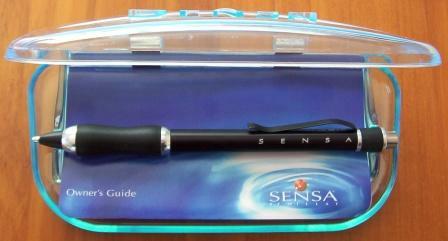 My first encounter with aging of a modern pencil was a while ago my Sensa Carbon Black Mechanical pencil. After about 5 or so years in storage I noticed that the plasmium grip was deforming under the force of gravity. The plasmium gel was being dragged down by gravity and pooling on the lower side of the grip. After another few years droplets of oily liquid started to form on the outside of the grip as if some liquid was migrating through the outer skin of the grip. Eventually after 10 years or so the outer grip skin was very tacky and the gel pimples burst with gel oozing out of the little tears. Sensa had ceased business, and it’s doubtful they would accept any warranty claim after such a period, so my sticky oozy Sensa pencil went into the rubbish bin. That was a fair few dollars gone. My next encounter with modern aging was much more disturbing. 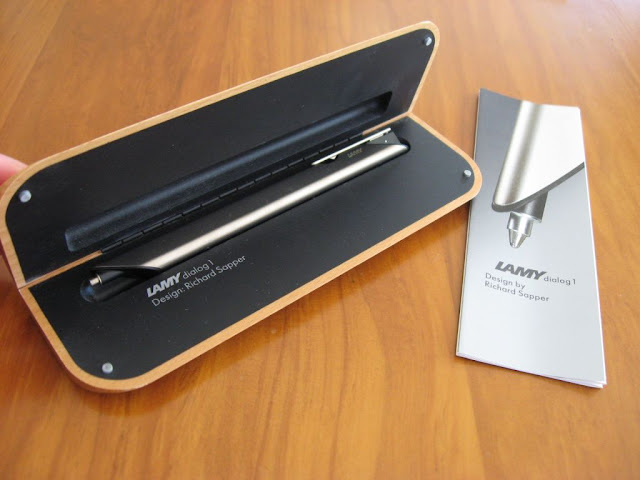 I really liked my Lamy Dialog 1 ballpoint pen. I always meant to get around to reviewing it but never did. After about 7 years I noticed some discolouration on the body. Small dark spots, that you could feel with your fingernail. The Dialog 1 is Titanium PVD coated metal and somehow the titanium coating seemed to be corroding, which seemed implausible. Some research into PVD coatings did reveal that the thin coatings used on decorative objects like jewelry are “porous” and much thicker coatings are required for maximum corrosion resistance. I don’t know what’s going on with my Dialog’s coating, whether it’s some sort of poor metal substrate cleaning at the time of coating, coating porosity, or biological attack from a microorganism that has got into the metal structure through the so called porosity. 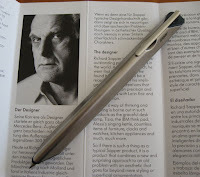 In any event my Dialog 1 is no longer an attractive premium writing instrument. Lamy customer services have been silent. PVD coatings are very thin and the forums of jewelry and watches have many stories of how they wear off so I was not keen to try any metal polishes on the titanium finish. Here’s another disappointing one that hasn’t lasted. Ten years ago when I got it, this Platinum Mistake Double Action multi pencil was white, but now it is a creamy yellow, and I can assure you it has been stored in the dark, away from sunlight and UV. You won’t be able to see them in the picture, but the lower half of the body also has two hairline cracks starting along its length. Now for the biggie. When I started this blog I declared my dislike of rubber grips, but constant contact worked like some sort of psychotherapy and I came to begrudgingly accept them. That was a mistake, I should have stayed a hater. If you go searching the forums of camera, optics, hunting and nautical people you will come across lots of discussions about rubber coated and rubber armoured cameras, binoculars, telescopes, rifle scopes and the like, going all soft and sticky over time. Then there’s the kitchen utensil, mobile phone, IT and gaming forums… it’s a sticky gooey rubbery mess out there. I too have experienced this with my reputable Japanese brand telescope's rubber armour becoming a soft sticky mess over a 10 – 15 year period. Bushnell optics even has a FAQ for your binoculars going all sticky, and requests that you contact them. Basically with natural rubber it is a process sort of like it returning to its original latex gel liquid state, and a similar degradation process with many synthetic rubbers. Complex long chain molecules break into smaller sections, plasticizers and lubricants migrate to the surface and so on. Anyway, there’s nothing you can do about it, it just happens, although the circumstances of use and storage can affect the timescale. Down in my mechanical pencil storage department you don’t have to look too far to find a soft sticky wet feeling rubber grip. There is a vast range of different service lives for different synthetic rubbers. From my experience, ten years seems to be about the average time for degradation becoming obvious. If you don’t see any changes after 10 years then it is probably one of the silicone or other synthetic rubbers with extremely long service lives. Here’s two Faber-Castel Grip Plus mechanical pencils, both obtained 12 years ago at the same time, both stored side by side in the same container. Visually they look nice, but when you pick them up one rubber grip is noticeably sticky and leaves a residue on your fingers. The other is much less tacky and does not leave a residue but is clearly starting to degrade like its cousin. Of course who knows what their actual date of manufacture was. Maries Leadholder only lasted a couple of years in my office drawer before it started becoming disgustingly sticky and I relocated it to the rubbish bin. To be fair, most of the rubber gripped writing instruments are in the economy and low price range brackets, so the manufacturers probably only think of them as needing to last a few years, and they certainly would not be thinking about future classic vintage pencil status. Related to this rubber issue is the degradation of presentation cases. PVC is a very common and useful hard plastic used to make all sorts of things including roof gutters, house cladding, LP records and helmets but if you add plasticisers to it, it becomes very flexible and we then often start calling it vinyl and making erasers, clothing, furnishings and so on. The thin flexible vinyls tend to breakdown over time and some seem to become susceptible to biological attack from mould. I imagine it’s related to the particular plasticisers and additives used in the plastic formulation. Here is my Pilot KICPA case. It was very slightly tacky when I first bought it, but now things have gone further. It is still only slightly tacky to the touch, but the case is a very strong spring loaded one and you have to grip it quite firmly to open it, which means you press the soft plastic covering, and sometimes the vinyl or PU or whatever plastic it is sticks to your fingers and comes off its fabric backing. One thing of genuine concern though is that virtually all mechanical pencils with a ratchet lead advance system have some form of lead retaining rubber ring or similar at their tip. Let’s hope that they use one of the good quality very long service life rubbers for that! And if you think I am getting bent out of shape over all of this, at least I’m not like the old floaty pens from the 70’s or so. Virtually every one of them I have seen in real life is bent to one degree or another. Releasing moulded in stress over time… all those floaty ships, cars and beautiful ladies… all warped. Just updated the Sell / Swap, and split into three pages. Well, I have been making some progress. I believe I have found and updated all the broken links on the blog. If you find any broken links, other than in peoples comments, then please let me know so I can fix them up. A lot of the broken links could be updated to new addresses but of course a number of websites are just entirely gone so the link is permanently gone. I updated Jeopardy in the sidebar. It went up quite a bit. That's a crazy number. I am out of control. To help get the collection rationalized I have created a Sell Swap Trade page, you can access it by the Page links just under the blog header up above. Ebay is not an easy option down this way. You see eBay started up here with some fanfare, but after 5 years or so they quietly shut down without saying a word, as our local opposition auction site smacked them down. Thus buying from eBay is quite easy, but with no domestic site, selling as an individual is quite hard. Unfortunately for me the number of mechanical pencil buyers on our local auction site is nearly zero when you don't count me :) Starting out with a bunch of Papermates and some older vintage stuff. I will be adding things slowly to the trade page, so if you do want anything then give me a yell and lets see if we can work something out - sell for money, swap for something, all options are on the table. It has been interesting watching Google slowly accept my return. Before I took the blog offline I had about 750 URLs indexed by Google. Of course that fell to zero when I shut down, but over the last few weeks the Google Bot has slowly started worming its way through the blog, and now has about 150 URLs indexed. It's slow going. I guess I just thought that once the Bot found your website it would index it all quite quickly in one go, rather than crawl slowly through it at a snails pace. 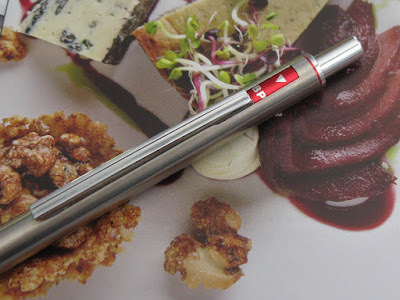 I have tripped across a few Newman mechanical pencils over the years, but know very little about the company, and their pencils haven’t leapt up and slapped me across the face to get my attention… until now. What little I can find out about Newman can he summarised as follows. Newman were a reasonably common and successful Japanese brand in the 1960’s through 80’s. The end. If you know more, then please do enlighten me. Anyway, quite a few years ago, Germ of the now long gone Pencils11 blog sent me a box of “odds and sods” and within it a Newman mechanical pencil caught my attention. With this blog being on hiatus for so long, it has taken me all this time to get around to posting about it, but here goes. At first this seems like a reasonably ordinary slim line stainless steel mechanical pencil with lightly grooved grip section and a rather attractive bright red push top button. Let’s push the button to advance the lead. That’s a bit strange; the red push top button is actually a sleeve around the real inner stainless button. Pushing the button down has pushed the sleeve about half way into the body, and it stays there. Also, the sleeve is attached to the pocket clip, so the pocket clip has also slid down a channel in the body and now exposes the letter “BP”. I’m confused. Ballpoint? The multi-national oil conglomerate? I don’t know. But the pocket clip channel is longer still, so you can slide the pocket clip and the sleeve further down, all the way down, down and out. Now just a tiny little red ring is left. Rotring as some might be tempted to say. Really, I’ve got no idea what this system is all about, perhaps the sleeve is some sort of anti-accidental activation device? Or perhaps it is just purely aesthetic, for when you have the pencil clipped in your shirt pocket the shiny red sleeve is fully extended? Has anybody got any other ideas? A couple of other images for you.